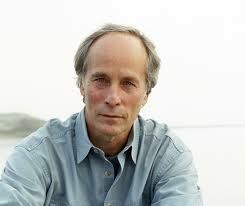 Richard Ford has a knack for creating characters who are down and out and only hanging on by a shoe string. In fact, the main character of Let Me Be Frank with You is a case in point. This collection of four lengthy stories is a mixed bag at best. The first two I consider to be superb, but the second two, not so much. Had I read these stories in reverse order, they would have made a quick trip to “Rule of 50” oblivion. Ford has garnered some praise, but notable prizes have escaped him. I will say that I have enjoyed Fords novels much more than his shorter works. Frank Bascombe is the center of these pieces. He frequently uses these characters to string the rest of a collection together. I confess I have a certain soft spot for Frank. The first story in the collection, “I’m Here,” tells about a house Frank owned and which he sold to Arnie Urquhart, who in turn sold it a few months before a big hurricane hit the New Jersey shore. This storm wiped out most of the shore properties. The man Arnie sold the house to wants his money back, and he enlists Frank’s help to show the error of his fantasy. Frank muses about this situation, which is a frequent pastime of his. Ford writes, “Back in the bonanza days of the now-popped realty bubble, I sold Arnie not just a house, but my house. In Sea-Clift. A tall, glass-and-redwood, architect-design beach palace, flush up against what seemed to be a benign and glimmering sea. Anybody’s dream of a second home. I saw to it Arnie coughed up a pretty penny. Sally and I had decided to move inland. I was ready to take down my shingle. It was eight years ago, this fall—two weeks before Christmas, like now” (9). Soft spot! The second story—the best of this collection—is “Everything Could Be Worse.” One day, “as I pulled into my driveway on Wilson Lane, I saw a woman I didn’t know standing on my front stoop. She was facing the door, having possibly just rung the bell and put herself into the poised posture (we’ve all done it) of someone who has every right to be where she is when a stranger opens the door—and if not every right, at least enough not to elicit full-blown hostility. // The woman was black and was wearing a bright red Yuletide winter coat, black, shiny boots, and carried a larger black boat of a purse, appropriate to her age—which from the back seemed mid-fifties. She was also wearing a Christmas-y green-knit tam-o’-shanter pulled down like a cloche, something a young woman wouldn’t wear” (65). Ford seems moderately fond of hyphens, parenthesis, and asterisks. I do not mean to say I dislike this collection, but the unevenness of the last two stories, together with a smarmy attitude, dims my admiration just a bit. I imagine him throwing sarcastic remarks over his shoulder to unsuspecting followers. Frank has a sideline in recording books for the blind. Ford writes, “This fall, I’ve been reading Naipaul’s The Enigma of Arrival (30 minutes is all they or I can stand), and in many ways it’s a book made for hearing in the dark, in a chill and tenebrous season. Naipaul, despite apparently having a drastic and unlikeable personality, is as adept as they get at throwing down the gauntlet and calling BS on the world” (67). Richard Ford, in Let Me Be Frank with You, shows he is a good writer, and despite my slight misgivings, he remains a favorite. 4-1/2 Stars.